flat-free hours for real savings! and traction on any terrain. A cushioned ride without the bounce. Telehandlers are versatile machines that combine the features of several pieces of equipment. As a result, they're a common sight on a wide range of job sites in construction, agriculture, material handling, utility work and other industries. The stock tires found on most machines are likely to offer good all-around performance, but they may not be durable enough for demanding applications. Upgrading to a solid rubber option from McLaren Industries can help you get the most out of your fleet, keeping your productivity up and running while maintaining a safe work environment for your team. - Improved stability: Stability is key to a telehandler's ability to reach high places. 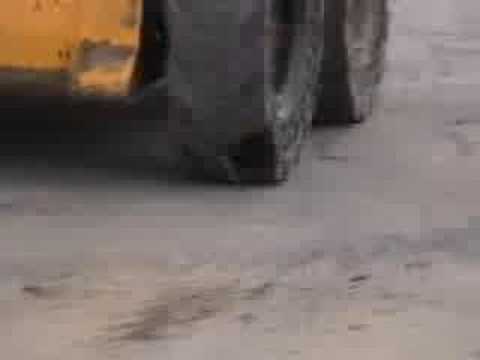 Solid rubber tires promote this by reducing bounce for a more secure and stable performance. As a result, you'll be able to maintain safety while still taking on tough jobs that require working at height. - Longer lifespan: McLaren Industries' solid rubber telehandler tires have more rubber and a deeper tread than conventional pneumatic tires. A single set can be counted on for over 5,000 flat-free hours between changes, minimizing downtime for your fleet and helping you stay productive. - Cost-effective performance: Between their lower maintenance requirements, longer life and improved versatility, solid rubber telehandler tires are one of the most cost-effective options in the industry. McLaren Industries manufactures several models for different applications and price points, making it easy to find the tire that's right for the task. - Nu-Air® Dirt Terrain (DT): The Nu-Air DT is one of our bestselling products, an excellent performer that is flexible enough for use on- or off-road. It offers a smooth, stable ride on any surface, and it features a unique tread pattern that delivers stability on dirt, gravel, sand or other loose surfaces. We offer our DT tires in three sizes: 12x16.5 (33x12-16), 13x24 (50X13-24); 14x24 (53X14-24). - Nu-Air All Terrain (AT): The Nu-Air AT combines the advanced features of the DT with a wide footprint design that provides additional ground contact and, as a result, better performance and longer life on hard surfaces. The AT comes in the same sizes at the DT: 12x16.5 (33x12-16); 13x24 (50X13-24); 14x24 (53X14-24). - Nu-Air Rocky Terrain (RT): The Nu-Air RT is, as the name implies, our heaviest-duty solid telehandler tire. Count on it for maximum traction in rocky terrain — it is the ideal choice for quarry and aggregate, waste handling and other demanding jobs. Available in size 14x24 (53x14-24). All Nu-Air tires feature our exclusive Semi-Pneumatic Technology™, a three-layer system that combines ride comfort comparable to an air-filled tire with the puncture-free performance of a solid product. Request pricing or call us at (800) 836-0040 to get more information about how and why this technology can deliver benefits for your business. With the increased usage and popularity of telehandlers, the NuAir tires provide a stable, cushioned, flat proof ride that is essential for both safety and productivity. The DT tires are the most versatile of our telehandler tires. They provide great traction and stability when run either off-road or on hard surfaces. And of course, NO FLATS! 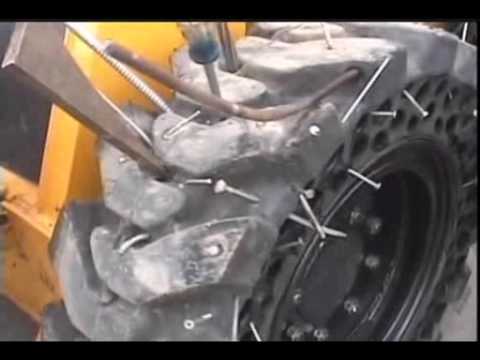 Semi-Pneumatic Technology™: a puncture resistant solid cushion tire technology. The Nu-Air tires use McLaren proprietary Semi-Pneumatic technology. It combines the durability of solid rubber tires with the comfort of pneumatic tires. Using three layers of rubber compound and multiple shock-absorbing relief holes, Nu-Air tires outperform and outlast the competition and give you the peace of mind you deserve. With the increased usage and popularity of telehandlers, the NuAir tires provide a stable, cushioned, flat proof ride that is essential for both safety and productivity. The AT tread pattern is the most practical choice for running on hard surfaces such asphalt and concrete and also provides traction when used off-road. The Nu-Air® Rocky Terrain (RT) tires for telehandlers are engineered to perform well in the toughest environments. The RT tread pattern provides maximum traction on harsh, rocky terrain as well as in scrap yard and demolition applications.